Niger Delta agitators signalled a return to hostilities in the oil-rich region, yesterday, when they called off the subsisting seven-month ceasefire with the Federal Government brokered, November last year, by Pan Niger Delta Forum, PANDEF, declaring Operation No Mercy and Destiny Takeover of God-given Resources. The campaigners, under the auspices of 21st Century Youths of Niger Delta and Agitators with Conscience, led by self-styled ‘General’ W O I Izon Ebi, blamed the Federal Government for the new turn of event, saying it (government) has, over the years, remained adamant in implementing agreements reached with the region’s representatives, including the 16-piont demand of PANDEF. 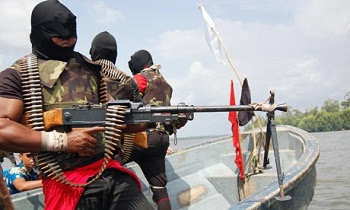 The militants were irked that the Federal Government was inciting the region, citing the latest provocative plan to build a $2 billion Refinery in Katsina, the home state of President Muhammadu Buhari, with money from the Niger Delta.